After spending the last four days in St. Louis to give two social media talks, it’s nice to be home. And after getting settled in, here are some social media news items I’ve caught up on that you should know about too. Study Finds Most Organizations Not Responding to Facebook Fan Questions: A recent study by Quintly, a social analytics provider, finds that 60% of questions posted to Facebook fan pages are never answered. The study found an average response rate of 42.2% among a sample of over 76,000 pages with at least 1,000 likes. Quintly counted responses if they were made within 14 days after a question was posted. The study also found that 18.5% of questions were answered within two hours and 34.2% within one day. The study is a reminder that communication on social media is a two-way street and organizations would do well to monitor and communicate with their fans. Facebook and YouTube Drive Almost One-Third of Mobile Traffic: Facebook and YouTube account for about 32% of mobile web traffic according a recent study released by Sandvine, a networking equipment solutions provider. 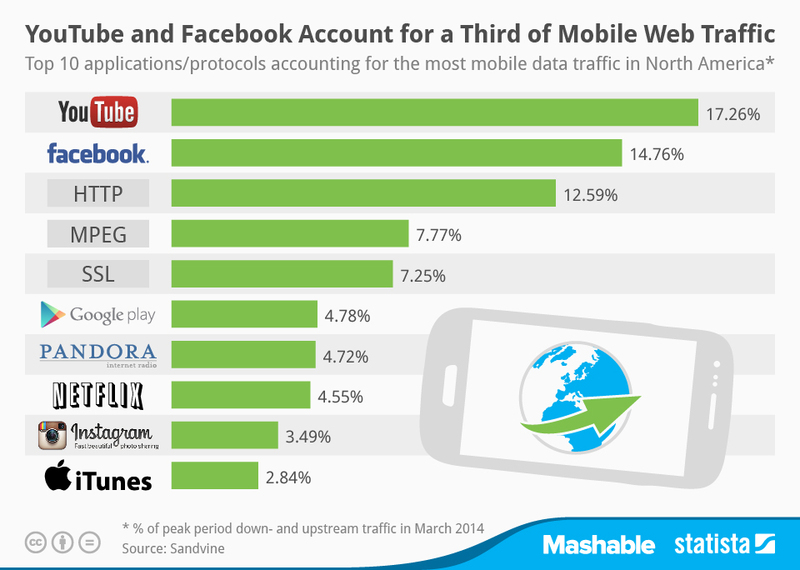 Facebook traffic, which alone accounts for 14.76% of mobile traffic, is comprised mainly of users content upload. 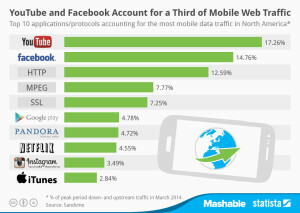 YouTube traffic is mainly due to mobile viewing and accounts for 17.26% of mobile traffic. Millennial Moms are Most Active Pinterest Users: Millennials with children are the most active users among Pinterest’s large female and total user base according to the 2014 Pinterest Media Consumption Study by Ahahology. The study also found that active Pinterest users generally consider themselves early-adopters and are more likely to try something (recipes, activities, products, etc.) they have seen on Pinterest.